My sister Puanani has had a tough year. An unhappy marriage, an unhappy decision to end the marriage, which led to an unhappy divorce. I go through periods of feeling sure that my fabulous big sister is handling everything just fine, hanging with friends and being LA-glamorous. And then I go through periods of (let's face it) knowing better, and worrying, and not knowing what to do for her. So I knit her socks. True to the story of Puanani's life this year, that hasn't necessarily worked out so well. I sent her Hedera right after the moving-out decision. Now one would think that a woman in her thirties would know that putting wool through the dryer causes shrinking, but she was admittedly distracted. Apparently those socks would now fit an obese six-year-old. So then, after the divorce was filed, I sent her Lacy Bed Socks. I included a sheet of paper with washing instructions. 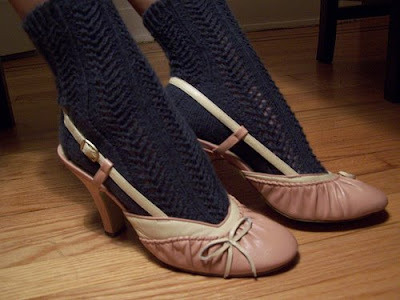 It occurs to me, however, that lacy alpaca socks with big bows are not necessarily my sister's style. Especially not when one is trying to feel, um, desirable (and not like a grandmother). So, a month or so ago, I went out to California to have a girls' weekend with my mother, my little sister, and Puanani. And Puanani made a request--would I knit her a scarf? She had never owned a scarf. (Freaking Californians). Would I please knit her one? She would buy the yarn. She did have one request--could it not be fuzzy? I stared at her. Wool scarves are, well, they're a little fuzzy. That's wool for you. When we got to a craft store (okay, I'm spoiled by working so close to Purl. But I was happy to see Lamb's Pride and Patons again. Old friends...) Puanani pointed out what she meant by "fuzzy." Riiiiight. Yeah, no muppet scarves. Check. We settled on some Patons soy wool stripes. Well, when I say "we" what I mean is that I insisted because I really wanted to knit with it, and frankly how boring would a Wool-Ease scarf be? I had just finished a Clapotis for myself, and I have to confess that I had been somewhat mystified over the popularity of this pattern. Sure, it's a scarf. It's even a nice scarf. So? But then...it's true. There's something about knitting it. The repetition, and yet the constant interest. The sleekness, and yet the bumpiness. It's my favorite scarf. 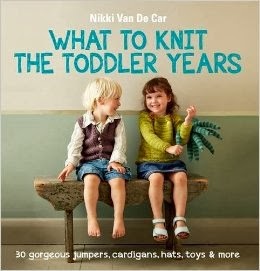 And even more amazing--I desperately wanted to knit another one. I have never had that happen before. 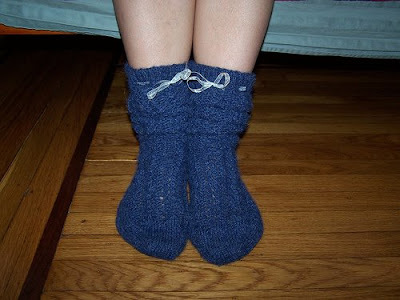 I knit magic loop because I suffer from the worst case of Second Sock Syndrome on the planet. Knit it once, might as well throw the pattern away. But not this time. 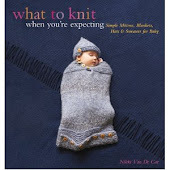 I felt like I'd finally settled on a knitted gift that perfectly suited my sister. Bright, cheery colors contrasted with sleek lines. 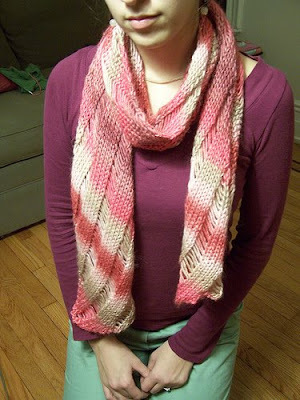 Of course, it did occur to me that Patons SWS wasn't exactly the right weight for Clapotis. I switched to size 11 needles, cast on only twenty or so stitches, and dropped huge gaping stripes. I have to admit, I had my concerns. (My So-Called Scarf was my back-up plan). But I love it. I may even like it better than my own Clapotis (though mine is softer). I have to admit, I kept it and wore it for a week or two before sending it off to California--hey, I was softening it for her! I haven't actually heard anything from the West Coast lately...I think I may have knit my worry rather than, you know, called to check in. Hopefully the love and concern and faith (not to mention self-sacrifice--I did finally send it to her, after all) have worked their way into the fabric, despite the fact that I never call.